there are any heavy objects at hand that you may reflexively fling in a desperate, instinctual attempt to protect yourself from terminal ignorance. Added to the Climate Denial Crock of the Week collection. 2. Data and Methods: The fact that meteorological stations are very few and geographically concentrated in the USA and north hemisphere is well accepted. Their record is very incomplete, mainly during the last three decades; this discontinuation was compensated by systematic and meteorological satellite data acquisition. The CO2 data is less variable but the data sites, around 42, are concentrated in the North Atlantic; only 10 sites in the south hemisphere, only one in South America and in Africa and none in the large Amazon region. Translated by google perhaps? or bablefish? The IJG stands proudly along side of “Advances in Internet of Things“, Sociology Mind and Soft Nanoscience Letters over at Scrip. None that I saw were more than a year old and a number of them have yet to publish anything at all. UPDATE: Jan 7/ 2010: From Wikipedia “its journals duplicated papers which had already been published elsewhere, without notification of or permission from the original author. In addition, some of these journals had listed academics on their editorial boards without their permission or even knowledge, sometimes in fields very different from their own.” which is referencing a Nature article about Scrip. Can’t make this stuff up folks. For any that think it matters, the paper basically correlates regional weather with solar variation, PDO etc, and then calls it climate. It’s really too silly to waste any time on, so naturally the Denialosphere will be announcing it as “the final coffin nail” (again). Do you suppose this is part of the 1% of Denierdom that science would benefit by taking seriously? Is like a discussion of fairies. and then send you to read “The Liar and the Outlier“ and as many others as may delight you. just runs away when cornered. has now said that she will not return. Here here here and here. Update: Apparently the many posts critiquing Ms Curry’s behaviour which I listed are either poorly written, of no substance, or incoherent in some other fashion since “if there are one or more interesting or valid points in all of these posts, they are very hard to find.” source Ms Curry. I was unaware that being “on the same general “side” ” meant you were not to be critiqued and called on it when found to be in error. Indeed isn’t that pretty much what the entire scientific publishing process is about? if not science itself? Oddly, being “on the same general “side” has not spared the IPCC or its’ “cadre of scientists … these priests of the IPCC?” from some very harsh criticism. Criticism far more inflammatory, not to mention baseless and without substance, then what has been said about Ms Curry. Does this exemption from criticism work only one way? *Upon reflection I realize this could not really be true insofar as she clearly did not know what the post actually said, so she could not possibly have been trying to refute the points it actually made. Probably it would be more accurate to say that she detected that the post was not one of gushing praise (the pictures gave it away?) and hence fired off some generic denials and an irrelevant invitation to visit her blog to “get the truth” (about what?) hoping thereby to fake it. When pressed to say something that was actually relevant and of substance she grew testy, abusive and left. Mind you, Curry’s dissembling reads like Wittgenstein compared to some of her fans (and down). “So, the “significance test” suddenly (almost magically….) goes from being non-significant to significant at p = 0.05 (because Pr is now 0.0338), or 38 times out of 1,000 by chance. What really comes across in my meanderings and discussions with skeptics is that the really vocal types seemed to have dropped out of basic science at school or are born liars/misrepresenters (corporate advertising/marketing types). They seem to think that science is a personal life choice and that one can choose what science to believe in. Actually my last post wasn’t very clear. The point about gases I was trying to make is the fact that a gas may exist ‘naturally’ in the Earths environment doesn’t make it good or bad to humans. Hence the use of the word ‘natural’ to describe a gas is redundant. It doesn’t imply a gas is ‘good’. You were clear enough I thought. I have found that pointing to people that water is an abundant, natural, necessary for life substance, but pour 250 ml into your lung and as you drown contemplate how even a relatively small amount that is in the wrong place can have a significant impact. See Bachmann considering White House. Right. You mention getting water in your lungs is dangerous, but even drinking too much water can be dangerous. Drinking 2 liters of water is considered good for you, but drink much over 5 liters of water a day and your salt balance can be affected. Drink more than ten liters without taking salt and it could well be fatal, even where drinking much water is essential. With no man caused CO2 in the atmosphere, it would be very cold right now. I would not even want to go back to pre industrial levels (280ppm), but 350ppm and above is dangerous. You can have too much salt in your diet, too much fat or even just too much food, You can breathe air that is too rich in oxygen. Is “enough” such a hard concept. All true enough, but I wanted to keep the “even relatively small proportions” aspect of the analogy to help people recognize it as relevant to the CO2 problem. Over the years I have tried a broad range of analogies that I thought illustrated the point, and this seems to be the one that people relate to most quickly & clearly, at least in my experience. 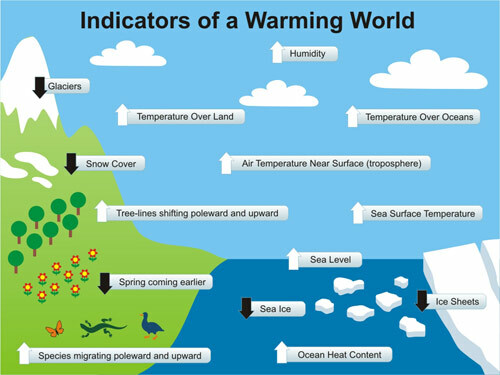 on January 7, 2011 at 1:16 am | Reply New paper – “absence of correlation between temperature changes … and CO2″ « Wott's Up With That? For modern civilization to survive in the long term there is a narrow window of viability in the CO2 concentration. 280 – 320 ppm? both ends are a guess. Sub 280 we are going to cool, above 320 we will slowly warm. At 390 ppm not so slowly. A bit like my cholesterol level. It hasn’t changed in 15 years, but now my doctor is worried about it. The rules have changed.